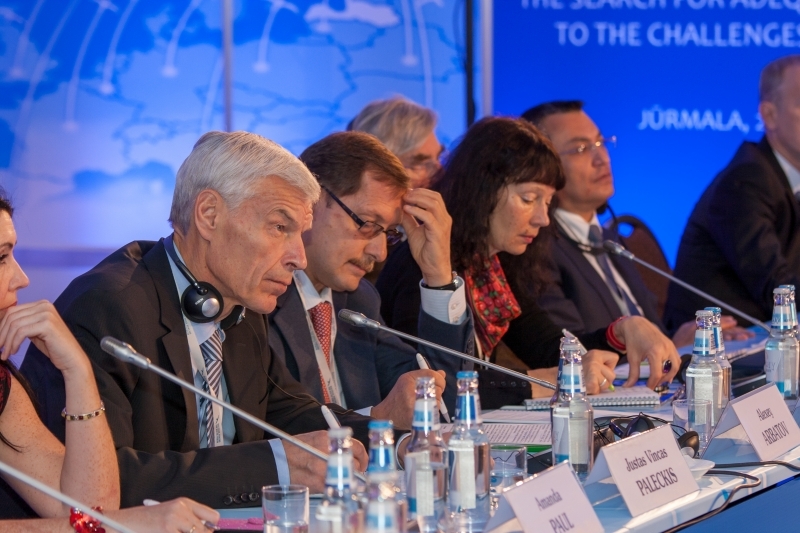 On October 25-26 Jurmala hosted the annual, already the15th "Baltic Forum". The anniversary conference was dedicated to the theme "Transformation of Eurasia: the search for adequate responses to the challenges of our time." This time the theme traditional for the "Baltic Forum" - logistics and transit - was organically complimented by the increasingly relevant topics of energy and security. The annual conference of the "Baltic Forum" is an international discussion platform developed in the region over the past one and a half decades. It offers competent exchange of views and ideas between policy makers and experts from different countries on topical issues of global and regional processes. At the global level, a period of fundamental change affecting various regions and partnerships has started. Therefore, the international community highly requires the task to reformat global mechanisms in line with the challenges of the 21st century, including the interests of regional development and the strengthening of cooperation between different structures and groups of countries. At the upcoming conference it has been envisaged to raise a few topics affecting problems and prospects of cooperation in the area from Lisbon to Vladivostok. Integrated approach to the efficient development of logistical tasks of the multimodal transport corridors. In view of the increasing traffic flows between Europe and Asia it becomes important to develop inland container transportation by rail - primarily from the Asia-Pacific Region (APR) through the territory of Russia and Kazakhstan into the member states of the European Union (EU). In addition to close cooperation of Russia with partners in the Baltic States with the aim to improve such transportation, it means a partnership for the whole of the railway of 1520 mm, with gradual expansion to the north-eastern provinces of China, Turkey, and Iran. Modernization of transit land corridors should be supplemented by rapid improvement of the road network all the way from China to some countries in Eastern Europe. Particular attention should be paid to the growing potential of the Northern Sea Route as well. In view of climate change demand for this corridor will likely increase. The analysis of the prospects for this kind of demand is useful for assessing the possible impacts on the entire transit infrastructure. The issues of energy cooperation between the EU and Russia and Eurasia. Energy sector of the world economy is on the threshold of major changes. However, in an effort to diversify its natural gas supply and limit the ability of suppliers to exercise economic dictatorship the European Commission has adopted the Third Energy Package in 2009, which directly affects the interests of Russian companies. These and other factors have caused Russia to make certain adjustments to the energy plans. This applies to oil and gas industry, which together with nuclear power still has a significant share in global demand. Among the various energy segments against the background of increase of industrial production, development of new technologies and growing importance of telecommunications, increase of electricity production becomes more and more topical. Despite the known augmentation of negative perception in a number of European countries, this market still looks promising in terms of planned development of nuclear power. For the Baltic Sea region, it is primarily associated with the construction of Baltic NPP in the Kaliningrad region of the Russian Federation and Ostrovetskaya nuclear power plant in Belarus carried out by Rosatom, as well as with the implementation of the joint construction of Baltic NPP in Visaginas, Lithuania. Notable changes of supply and demand in the global and regional energy balances and the impact on policy decisions determine the need to revitalize proper expert analysis of problems and prospects for development in Europe and Eurasia, including the Baltic region. International cooperation in strengthening Euro-Atlantic security. Increasing uncertainties in the field of security at the global and regional levels so far for many countries and international organizations have brought forth more dangers than positive opportunities. Correspondingly the need to expand these opportunities through strengthening of joint action, more dialogue about the advisability of reforming the architecture of security and the stating of new forms and methods of cooperation between the major players increases. Prospects for Euro-Atlantic security in the surrounding turbulent world are one of the most important and topical subjects for joint consideration of countries and groups of countries in this area. To do this, the task to audit by experts the emerging threats to Euro-Atlantic security, the main obstacles and differences to strengthen it, as well as to provide an assessment of the trends and mechanisms to overcome them and strengthen communication throughout the area from Vancouver to Vladivostok continues to be in demand. Given the complicated relations between the major players in this area in recent years, such problems are seen to be particularly relevant. In this context and in the effort to unravel the current and potential problems attention should be paid to issues of interoperability and cooperation in the format of Russia-NATO, NATO-CSTO, linking this to the major challenges for all participants, which might arise in the near future. The conference was held on the eve of the Eastern Partnership Summit in Vilnius; therefore the experts participating in it devoted a lot of time to the discussion on how the relations between the European Union and Russia in general, and between Brussels, Moscow and Kiev in particular will develop. The conference participants agreed on the opinion that now the relationship between the EU and Russia and the development of the Eurasian integration are complicated by numerous contradictions and are not experiencing the best of times. The Vilnius summit will largely determine their future direction, fate and dynamics. Considerable attention was paid to the logistics streams from the East to the West from the Pacific Ocean to the Baltic Sea, as well as the opportunities for Latvia and the other Baltic States to keep and probably even strengthen their strategic role and position in these streams. The rapid growth of the Chinese economy and the new projects of Eurasian integration in the post-soviet space are opening unprecedented opportunities for this. However, much in the new promising projects will depend on whether the political elites of the Baltic countries will display willingness to abandon their destructive anti-Russian and even Russophobe rhetoric. The standpoints of experts on the evaluation of this readiness differed. The transformation in the global energy sector and its expected impacts identified energy as a separate theme of the conference. The experts discussed how the global economic recession, which is still ongoing and the "shale revolution" would affect the existing infrastructure of energy cooperation in Eurasia. In this context, economically shortsighted and politically biased projects on the "liberation" of some Baltic States from the energy ties with Russia deserve criticism. Given the fact that the issue of "energy independence" is not on the economic agenda of the "old" EU countries, the experts tend to believe that these are transient "growing pains". At the "Baltic Forum" conference of this year the Azerbaijani delegation took part for the first time, which is quite natural, based on the fact that one of the main themes of the conference was the issue of regional security. The conflict situation in Karabakh and around it poses a serious threat not only to the regional, but also to the European and international security in general. The Conference participants agreed on the opinion that the resolving of the Karabakh conflict is possible only through peaceful means, one of the effective ways to achieve that would be to maintain a dialogue between the Azerbaijani and Armenian communities of Nagorno-Karabakh. In search of solution it is necessary to be guided by the provisions of the international law and to take into account the definition of the territorial integrity of Azerbaijan within the borders recognized by the United Nations. The main outcome of the conference became the awareness of the need to create an integration mega-project, which would bring together the European and the Eurasian Unions by a system of economic and cultural ties. In this project, there will be no "buffer zones" or "bridges", whereas the position of each of the parties involved will be determined by their willingness to work for the sake of integration. During the next conference of "The Baltic Forum" which will be held on May 30 and 31, 2014, the project should already obtain a more specific shape. By that time the Vilnius summit will clarify the issue of which political projects will be completed after it, which will only start to develop and which will continue. Latvia will be preparing in earnest for the presidency in the European Union, new challenges requiring adequate responses will add to the present ones. On June 13 2013 in the premises of the "Baltic Forum" held a meeting with the famous Georgia politician and film director Georgi Khaindrava, where he presented his documentary film " Beacon of Democracy". In the meeting participated members of Saeima, the representatives of the Georgian Diaspora in Latvia and Latvian journalists. The International Association ‘'Baltic Forum'' together with the Russian news agency ‘'RIA Novosti'' on February 24-26, 2013 organized the visit to Latvia of members of the Club for Editors in Chief from CIS countries, the Baltic States and Georgia. During the visit members of the Club met with the President of Latvia Andris Berzins, with the Minister of Transport of Latvia Aivis Ronis, they visited the Saeima, publishing group "Dienas mediji" and the publishing house "Petit".